With Mardi Gras and Bourbon Street stealing the spotlight, New Orleans doesn’t get the credit it deserves as a family getaway. But the Crescent City has plenty of kid-friendly fun up its sleeve — you just have to know where to look. From fanciful playgrounds to fighter planes, here are five great suggestions for sights and activities to keep little ones entertained. There’s nowhere in the world quite like the French Quarter. This is the neighborhood that symbolizes New Orleans, with its pastel row houses, curlicued iron balconies and jazz-tinged street life. At its heart sits Jackson Square, a park bordered by pedestrian-only walkways and anchored by the 18th-century St. Louis Cathedral. It’s a perfect spot for kids to run off steam while parents enjoy the outrageous people-watching. The Quarter grows more raucous as the day goes on. With kids, I enjoy it most in the early morning hours, when the streets are quiet and the European feel shines through: bakery trucks delivering the day’s bread to restaurants; locals biking to work or breakfast. For another perspective, take a tour with French Quartour Kids, who offer tailored walks that bring the area’s history to life for ages 4 through 13. I haven’t tried out their tours firsthand yet, but I love the idea of a company dedicated to making New Orleans so accessible for young visitors. It’s hard to imagine a park better designed for children than City Park, a little off the beaten tourist path but well worth seeking out. Kids could spend all day exploring Storyland, a playground dotted with beloved fairytale characters; taking a spin on the rides at Carousel Gardens Amusement Park; paddleboating around Big Lake; sniffing flowers at the New Orleans Botanical Garden; and more. For budding artists, City Park is also home to the New Orleans Museum of Art, which has an impressive permanent collection and sculpture garden as well as regular kids’ activities. Zoos, aquariums and insect museums are a can’t-miss trio for kids, and the Audubon Nature Institute covers all three. The Audubon Aquarium of the Americas pairs the usual suspects (sharks, rays, tropical reef fish) with an adorable penguin habitat, a terrific Amazon Basin exhibit and more. A short walk away is the Audubon Insectarium and Butterfly Garden, dedicated to all things creepy-crawly. Even for squeamish parents, it’s fascinating, especially the jewel-like displays of beetles and butterflies. My son loved the Bug Buffet, where he gleefully sampled crunchy Cajun crickets and several other delicacies. That’s adventurous eating at a whole new level! At the Audubon Zoo, highlights include the Jaguar Jungle, designed to evoke an ancient Mayan civilization, and the 1930s Monkey Hill, capped by a tree house and laced with walking paths, wading pools and rope bridges. Kamba Kourse, a four-story ropes course, opened this past spring, including the smaller Sky Tykes section for 2- to 7-year-olds. The early 20th-century architecture sprinkled throughout the zoo is a visual treat for adults. Fun fact: The amphibious Higgins Boats, key to Allied success in World War II, were crafted in New Orleans. That’s why the National World War II Museum was built here, and it is a spectacular addition to the city’s marquee sights. The exhibits span three buildings, yet they’re well organized around the war’s key themes and are easy to digest — no small feat given the overwhelming volume of information and memorabilia. Tickets come with a “dog tag,” a plastic card that lets each visitor select the profile of a real-life WWII soldier to follow. Scanning the card at computer stations within each exhibit pulls up a corresponding chapter of that soldier’s story. It’s a fantastic way to engage kids and help them relate to the war’s human impact. TIP: The museum doesn’t sugarcoat the realities of battle; it’s best for tweens and up. Warning notices are placed at the entrances to exhibits that may upset children. Where can you scale a climbing wall, invent a gourmet menu, design a Creole cottage and see the world through the eyes of a honeybee, all under the same roof? The Louisiana Children’s Museum packs a full spectrum of fun into its 30,000 square feet. A dedicated toddler area keeps the little ones busy while older kids try their hand at creative projects in the art studio or explore a replica of an 18th-century New Orleans home. The museum will be moving soon to new digs in City Park, with even more space for interactive exhibits and programming. As a rule, we don’t cover restaurants extensively on Ciao Bambino. But in New Orleans, mealtime is an event in and of itself, and such a quintessential part of the experience that it would be remiss to leave it out. Fine-dining venues, trendy cafes, ethnic eateries and holes in the wall line every block, and kids are welcome at just about all of them. A visit to one of the city’s iconic grande dames is a must. At Commander’s Palace, which offers a fresh take on Creole cuisine in a renovated 19th-century mansion, even the youngest guests are treated like VIPs. Older children will be fascinated by nearly two centuries’ worth of history at Antoine’s, where each dining room has a name and a past. Generations of the same family have run the restaurant since it opened; personal photos, regalia from Mardi Gras krewes, and countless other mementoes complement the traditional New Orleans menu. TIP: With kids, these elegant restaurants work best for lunch or brunch. They’re dressy but less formal than dinner, and the portions suit small appetites. At the other end of the spectrum, head to Guy’s or Parkway Bakery & Tavern for po-boys, savor just-shucked oysters at Acme and Casamento’s, or pick up a muffuletta at Central Grocery and take it down to the riverfront, where you can watch the boats go by as you munch. And no family trip to New Orleans is complete without a stop at Cafe du Monde for pillowy beignets under a snowdrift of powdered sugar. > Buy a streetcar pass. Kids and streetcars are a match made in heaven. While this is not the quickest way to get around town, it is, as far as I’m concerned, the most fun. Ride along the riverfront or down St. Charles Avenue, which runs through the beautiful Garden District en route to Audubon Park. Streetcars are cash-only, and they don’t give change, so a pass simplifies things. > Plan for lines. Big-name attractions and popular restaurants often have lines down the block. Book in advance when possible, or get there early. > Beat the heat. In a word, New Orleans is steamy. Plan on a dip in the hotel pool, a siesta or an air-conditioned museum in the afternoons to keep from wilting. Or treat the kids to a sno-ball, the velvety local spin on a sno-cone. There are stands all over the city, but it’s hard to go wrong with Hansen’s Sno-Bliz, a longtime institution where sophisticated adult flavors mingle with kid-friendly classics. Want Help Planning a Trip to New Orleans? CB! Vacation Consultants specialize in helping families plan travel all around the world. Our service includes a custom itinerary, booking private tours and guides, activity recommendations and more. Visit My Trip Planner and send us a request. 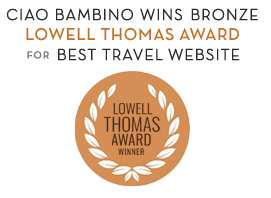 Editor’s Note: Ciao Bambino received complimentary passes for certain attractions from the New Orleans Convention and Visitors Bureau. As always, our opinions are our own. Photos by Lisa Frederick.